Folkmanis 2955 - Always dressed to the nines, this natty catty is ready to step out on the town. 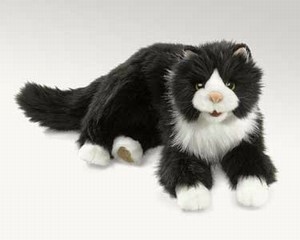 The TUXEDO CAT puppet has a movable mouth and front paws that bring him to life like a real cat - full of curiosity or seeking a lap for a nap. Measures 21" x 6"x 7". Movable mouth and front paws.